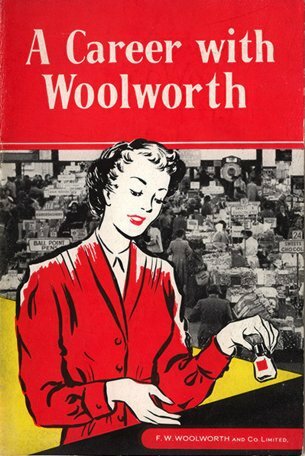 With over a thousand shops in the 1960s, Woolworth was represented in nearly every British and Irish High Street. Its personal service trading model and its paper-driven systems made it a huge employer, with a workforce of 100,000 people including over 50,000 working full-time five and a half days a week supplemented by part-timers and an army of Saturday Boys and Girls. This page explores the working practices of the era, and shows how the Company marketed itself as an employer. 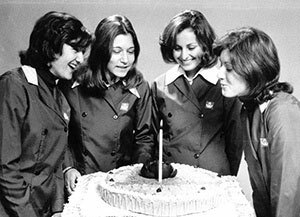 Its assumption that managers were men and workers were women, and its all-male Board of Directors as late a 1969, undermine the claim that anyone could make it from the Stockroom to the Board Room when over 80% of the workforce were female. Such stereotypes were gradually phased out in the Seventies before being consigned to history after the business changed hands in 1982. 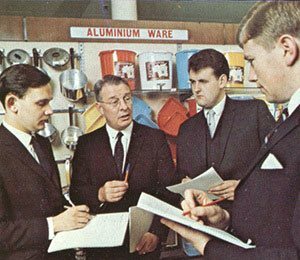 In the 1960s a typical sales assistant was paid £6 for a forty hour week, about 15p per hour. Many joined at fifteen, which was the school leaving age. They, like Saturday staff were paid a juniors rate of 7p per hour. Most people worked full-time, with their hours spread over five and a half days, including three Saturdays out of four. Stores normally had an early closing day when they shut at lunchtime, giving their people an afternoon off mid-week. The team also included Saturday Staff, who were normally still at school, and could be as young as thirteen. Many obtained permission to work an extra hour or two in the afternoons during the week after school, and during the holidays. With the exception of a few seaside stores, it was illegal to trade on a Sunday. Most stores operated a personal service model, with a staff member on each counter to serve customers and register sales. Customers were invited to "self-select", picking up the items that they wanted to buy and presenting them to the assistant. The great majority of purchases were paid for in cash. Most branches had more than twice as many employees in 1965, all working longer hours, than they did in 1995. And, in the days before equal opportunities legislation, the great majority of Managers and Executives were men. A woman Manager was very much the exception rather than the rule. By today's standards the chart below, which was originally published in the Annual Report in January 1958, is shocking for depicting all of the senior roles as being for men and all of the junior ones as being for women. The tills didn't add up the value of the shopping; instead staff did this in their heads or by using a 'ready-reckoner table'. Each item of merchandise was counted regularly. The stock on hand was recorded in pencil in a stock book. One or more senior assistants were appointed to the role of 'merchandiser'. They calculated recommended orders for the Manager. The merchandisers used complex fractions to show the stock on hand in boxes and parts of a box, before calculating 'stock commitments', consisting of a sales forecast for each line for the next six weeks. This was also calculated in boxes and fractions. For example if the store had 220 Mars Bars in stock and they were supplied in an outer of 144 bar, this was recorded as "1 76/144". After the manager had checked and confirmed the merchandiser's recommended orders, they wrote these out in long-hand on a company or supplier order form and retained a carbon copy in the store, ready to record the delivery when it arrived. The picture above shows the branch in St Mary's Gate at the end of Deansgate in Manchester City Centre, which was a typical large post-war Woolies. Its predecessor, the original store no. 230 had been called Manchester Arcade, it had opened on 6 August 1926 and had fallen prey to German bombers during a two-night blitz of the City, suffering a direct hit at 9.40 pm on Sunday, 22 December 1940. Reconstruction commenced in 1948, with the new premises opening in 1951. For several years the store stood alone in the centre of a bomb site, before the neighbouring properties were rebuilt. 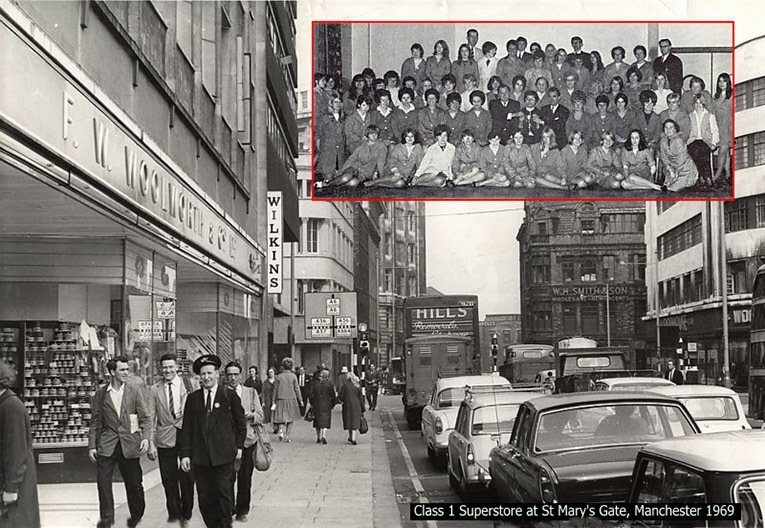 We have superimposed a picture of the full store workforce, which was also taken in 1969. The successful and popular freehold superstore was one of those sacrificed in 1972 to fund the huge cost of decimalisation. The decision to close was particularly ironic, given that questions had been asked in Parliament about how the chain had managed to obtain the steel for the huge girders in its superstructure shortly after World War II despite the City already having a large Woolies nearby on the corner of Oldham Street and Piccadilly. Most of the staff transferred to one of the neighbouring branches at Piccadilly or in Salford. Today part of the premises house a modern branch of Multiyork. 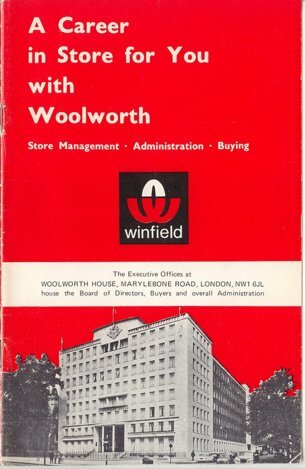 Two booklets were produced, one for store staff and one for Store Management and Executive (Head) Office roles. They set out the opportunities, rules and benefits as well as describing the work. A Deputy Manager could earn £25 a week (up to four times more than a sales assistant). This was about 60p an hour. Click either cover to download an Adobe PDF of the full contents. You can also download a free copy of Adobe Reader. 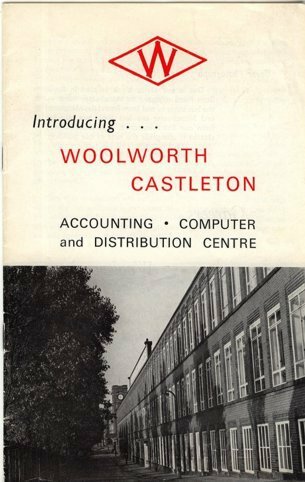 We also have a 60s recruitment brochure for the Central Accounting Office in Castleton, Rochdale, Lancashire. Click its cover to open an Adobe PDF of the full booklet. It includes lots of pictures of the site and explains how each of the main departments, including accounts and finance, systems and the large distribution depot worked. Castleton was one of the last rail-centric distribution centres to open in Britain. The site's railhead received goods from suppliers and was used to despatch goods out to stores across the UK by freight train. During the 1970s it gradually switched to shipping by lorry. The Castleton workforce celebrated forty years service to the business in 2007; at the time the facility looked set to continue for years to come. It had established itself as the administrative heart of the company and had become a centre of excellence in computing, distribution and human resource management. It also housed an award-winning call centre. Sadly events in 2008 put paid to any plans for a fiftieth birthday at the site.